Mozilla will release the final version of the long awaited web browser Firefox 4 tomorrow. This ends an odyssey full of delays that began about nine months ago with the first beta release of Firefox 4. Nine months, that is the projected time that Mozilla will need for the next three major Firefox releases. I have followed the development of the browser from pre-beta to the final release, and have to admit that it was not always a pleasant ride. It looked in the beginning as if the developers planned to make changes for the sake of changes, and not because they made sense or were demanded by the majority of the Firefox community. Features like the new tab management module Panorama or the move to display mouse over link addresses in the address bar caused quite a stir among the community, and were disabled or changed in the end. So what are the dominant new features that have been added to Firefox 4? The version offers now comparable speeds to other fast browsers such as Internet Explorer 9, Opera or Google Chrome. Firefox 4 comes with improved web standards support, including better CSS3, HTML5 and web graphics compatibility. Other notable features include hardware acceleration support, support for the HTML5 video WebM format, out of process plugins for Macs (Linux and Windows have it built-in since Firefox 3.6), privacy enhancements and multitouch support under Windows 7. Interested users can load an overview, that compares the changes with previous Firefox browsers, on the Mozilla website. As mentioned earlier, the Firefox interface has seen quite some changes. The dominating additions are the new Firefox button at the top of the browser that leads to most options of the menu bar. The menu bar has been removed as a result, and tabs have been moved above the Firefox address bar. Lastly, the status bar has been replaced and is now hidden by default. Check out Firefox 4, How To Undo The Changes for instructions on how to revert the changes (get the old menubar back, move tabs below address bar, display status bar). Enter about:config in the Firefox address bar and hit the return key. Accept the warning message if this is your first time, and right-click on a blank spot afterwards. Select New > Boolean and enter the value extensions.checkCompatibility.4.0. Double-click the entry afterwards after clicking OK and change the value to false. The final version has been pushed to the Mozilla ftp server where it is available for all supported operating systems and languages. It usually takes between 24 and 48 hours until the release is publicly announced on the Mozilla website. We do know however that Mozilla will announce the final release tomorrow, which is the time when downloads will become available on the web page. The only option for now is to download the release from one of the official mirror sites (for instance this one) or from one of the big software portals. Softpedia for instance lists the download already on their download portal. The Firefox developers have already announced plans to ship a first patch shortly after the final release has been published on the website, as it is likely that the increase in users will reveal bugs that have not been discovered before. Plans overall are to release three new major releases in this year, which would mean a Firefox 7 release at the end of the year. Plans are plans on the other hand, and we have seen how delays can break them. Many blogs have reported in the last days that the first Firefox 4 Release Candidate has been uploaded to the Mozilla ftp server. A release candidate build, and not the final release candidate, was spotted by one blog and almost every tech blog in my RSS reader reported about it. Let me be the first to tell you that the real Firefox 4 Release Candidate has been published just a few minutes ago. The release is currently available on the release server, and various mirrors throughout the world. Most mirror servers and the original Mozilla server block the download of the new release. One that does not is the server of the Umea University in Sweden. Just scroll down to Europe and click on that server to download the release candidate early. The release notes page has not been uploaded yet. Users who have updated to or installed Firefox 4 will get a page not found error. It is likely that Mozilla will enable automatic updates and the release notes page in the next 24 hours. Users of the beta of Firefox 4 may need to make a change to the Firefox configuration, if they have used it to override add-on compatibility. They need to write about:config in the address bar and hit the enter key on the keyboard. The new setting to override add-on compatibility in Firefox 4 can be added with a right-click and the selection of New > Boolean from the context menu. The new value's name is extensions.checkCompatibility.4.0 and it needs to be set to false. Firefox 4 will not check an add-ons compatibility with the parameter set to false. Update: Mozilla has published the What's New Page and the release notes. The release notes state the Firefox 4 contains "general stability, performance, and compatibility improvements". The list of fixed issues contains several hundred entries and is accessible here. The release notes page lists the downloads for all Firefox 4 RC versions. Well we've only just had Internet Explorer 9 out of the door on Monday but coming up straight behind it will be Mozilla's new Firefox 4 just next week. More's the point, the company is so confident that people will want to grab the browser as early as possible they've given a release time of 7am PST. Today's triage session concluded with all systems go for a Firefox 4 launch on March 22nd. We will continue to have triage sessions on a daily basis to watch for major issues; however, at this point, we've concluded RC1 will become Firefox 4 final.Firefox is the most popular browser for people who enjoy modding and adding plug-ins to use online. In this regard it's very different from it's main rival Chrome which focuses on stripped-down simplicity. Indeed the new IE9 has gone Chrome's way so this could enable Firefox to regain some of the market share it's lost in the last couple of years. The final version ofd the browser will be available simultaneously for Windows, Mac and Linux and it adds a few features that we've recently seen in other browsers including hardware-accelerated graphics rendering. It's an exciting time for the web browser industry as the war is well and truly back on after a few years of not very much going on at all. Mozilla has just released the latest, and last (as already stated in Firefox 4, The State Of Development), beta of the upcoming Firefox 4 web browser. The beta is currently distributed to Mozilla's worldwide distribution network which means that it may take some time before existing Firefox 4 beta users see the update notification in the web browser. The website currently links to beta 11 which eventually will be replaced with the download link to the newest beta of Firefox. One interesting change is that link hover information have been moved back down just above the Firefox add-on bar and almost exactly like Google Chrome and other browsers display those information. Firefox users who access multimedia contents will benefit from performance and stability gains in the latest beta version. 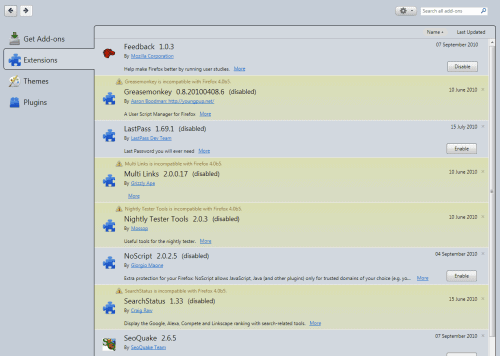 The full Firefox 4 Beta 12 changelog lists hundreds of changes and fixes, all linking to a Bugzilla error reporting page. The majority of Firefox ftp and http mirror sites appear to host the new release already. Interested users can take a look at the mirror directory to download the release before the official announcement on the website. What are the next steps? The team builds the Firefox 4 Release Candidate which is likely to ship in the beginning of March. Eleven hard blockers are left that need to be fixed in the coming builds. The final release will follow suite soon thereafter, provided that no serious issues are discovered in the meantime. Interested users can take a look at the Firefox 2011 Roadmap Updated, Expect Firefox 7 in 2011 and our guide Firefox 4 Essentials: What You Need To Know Before Making The Switch that prepares users before they make the switch to Firefox 4. When is Mozilla going to release the next beta of Firefox? When the release candidate and final build of the web browser? News are scarce at this point in time and I will try my best to give you an overview of things to come. The latest public beta version of Firefox 4 is beta 11 which has been available for some time. We knew that the team planned to release at least one additional beta to fix blockers that prevented the release candidate and final release. What we did not know was if that would be the last beta, or if another beta release would follow suite. Asa Dotzler confirmed yesterday that Firefox 4 Beta 12 "went to builds" on February 22. He furthermore mentioned that "this final (!!!) beta contains fixes to more than 200 hard and soft blockers". The important word here is final which means that beta 12 will be the last beta before the release candidate. He notes that there is still some patching to do for the release candidate build, with 26 remaining blockers of which half "have patches in some state of evaluation". Mozilla has not yet revealed a release date for the final beta, release candidate and final version of Firefox 4. It is however likely that the beta will be available in the coming days, maybe even today. I let you know once it becomes available so that you can update your beta versions of Firefox 4 to the latest as quickly as possible. Asa posted an interesting link in the newsletter pointing to Facebook's updated HTML5 games benchmark which sees Firefox in the lead followed by Microsoft Internet Explorer 9 and Google Chrome. Opera and Safari follow with a big performance drop. The reason? Hardware acceleration. The three browsers that lead support hardware acceleration, while the other's do not at this point in time. Opera however has already mentioned that they plan to integrate hardware acceleration in a future version, and that it will support at least the Windows XP browser as well. Back to Firefox. If the developers stay on track it is likely that we will see a final release of Firefox 4 in the first half of March 2011. I'm monitoring the Firefox release ftp server actively for new releases. The long awaited Firefox 4 Beta 11 has just been uploaded to the release server. It means that the Mozilla Firefox development team has finished one of the two remaining beta releases of the Firefox 4 web browser. Experience has shown that it takes between 12 to 48 hours before the release is officially announced on the Mozilla website. Computer users who are already running Firefox 4 Beta 10 will receive update notifications in the browser at around the same time. 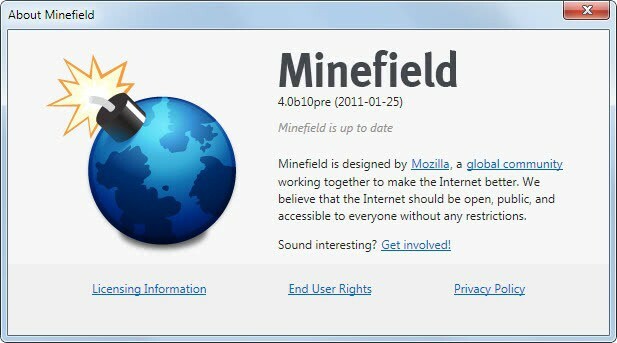 Some users may want to try Help > About Minefield to see if the update is already recognized by the browser. The release notes have not been updated yet, they still link to the release notes of Firefox 4 Beta 10. The release won't offer any new features as it has been primarily been used to reduce the number of existing blocker bugs that need to be fixed fully before the new browser can be released. The new beta is already on the official release server. We do not link to that server out of courtesy but you can find it easily yourself. You could also try one of the worldwide mirror servers to download the new beta of Firefox early. The mirror servers are currently being populated with the new release and it may take a few hours before they become available there. It was not clear if Mozilla needed one or two beta releases after Firefox 4 Beta 10 was released last week. The Mozilla Firefox development team is still trying to resolve the remaining severe bugs (betaN hardblockers) that are preventing the release of the next Firefox browser. Christian Legnitto, the Firefox release manager, made it clear on his blog on February 1 that there will indeed be two additional betas before the development team moves to the release candidate stage. "The current plan is to build [beta 12] when the remaining betaN hardblockers are done" which "is heavily dependent on fix and blocker creation rate" said Legnitto in the blog post. This basically means that the team did not manage to resolve all serious issues yet. The plan is to release Firefox 4 Beta 11 to the public for testing, work on the remaining issues, build Beta 12 and release it to the public as well. Mozilla last year postponed the release of Firefox 4 to the first quarter of 2011. Developers hinted at a late February releases which may be in jeopardy because of the recent development. It may be that Mozilla has to postpone the final release of Firefox again, since the team has to work on two beta releases and at least one release candidate before the final version can be build and released. Firefox 4 Beta 11 is expected to be released in the coming days, we keep you posted as usual. 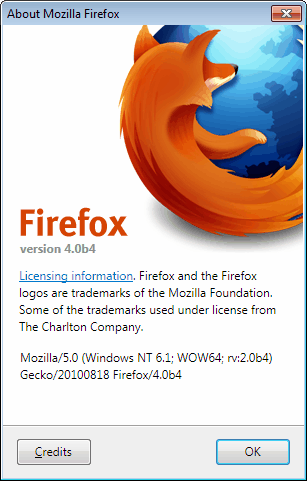 Interested users can download Firefox 4 Beta 10 from the official Mozilla Firefox 4 Beta project page. The beta is offered for Windows, Linux and Mac. It will automatically update to Beta 11 once it becomes available. Just yesterday we have been talking about plans to accelerate the Firefox development plan, and while the release of beta 10 of the upcoming Firefox 4 browser has nothing to do with that, it shows that the developers are urging to release the final version of Firefox 4 to start working on Firefox 5. Firefox 4 Beta 10 is not the last beta. Plans are to release beta 11 before the end of this month. If plans go ahead as planned it will be the last beta release before the release candidate. The tenth beta of Firefox 4 fixes many issues, a complete list of bugs fixed in the release is accessible here. Notable fixes include improvements in memory usage, compatibility and stability improvements when using Adobe Flash on Mac OS X and support for a graphics driver blacklist to improve stability. The full changelog listing those features and features that have been added in previous beta versions is available here. Downloads are provided on the same page. Firefox users who are already working with a beta release can use the internal updating mechanism to update their browser to the latest beta version. It pays to look at the known issues before doing so, especially if its the first time a Firefox 4 beta is installed on the system. Among the issues are problems with Hulu which blocks access to contents because of an "incompatible" browser (caused by a whitelist of user agents which has not been updated to include Firefox 4), slower scrolling in Gmail for some users and problems when downgrading to a beta release before beta 8. The latest beta of the upcoming Firefox 4 web browser has just been uploaded to the official Mozilla ftp release server. Firefox 4 Beta 9 is currently distributed to the worldwide mirror network to ensure an error free rapid distribution once the official release announcement has been made on the Mozilla website. It is likely that the announcement will be posted on site later today. Probably the biggest change in the latest beta is the inclusion of the IndexedDB web standard "for the storage of significant amounts of structured data in the browser and for high performance searches on this data using indexes" (via). Interested users can download the latest Firefox 4 beta from official mirror servers that offer both http and ftp connections. At least one additional beta will be released before the release candidate stage is reached. Firefox 4 Beta 10 Pre has already been in development for a few days and is available on the nightly servers. The beta is used to reduce the open bug count to zero. 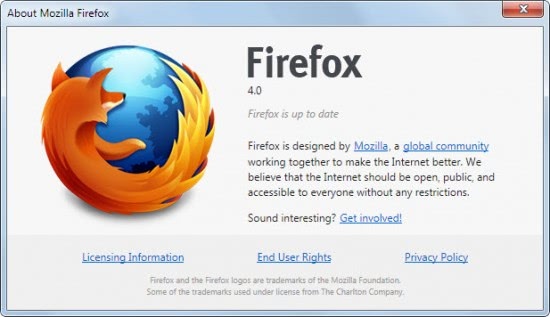 Mozilla plans to release the final version of Firefox 4 in February 2011. Update: The Firefox 4 web browser is no longer supported or maintained. Mozilla since then has moved to a rapid release process where new stable versions of the browser are released in a six week turn. As of March 2012, the latest stable version is Firefox 11, which will be replaced by Firefox 12 in April. Mozilla furthermore has created a so called ESR version of the browser, which stands for Extended Support Release. This particular version of Firefox has been designed for businesses and organizations who can't keep up with the new release scheme. Firefox 10 is the first ESR release, which will be maintained by Mozilla for seven release cycles. This basically means a new major version every 42 weeks instead of every six weeks. First spotted by Lee over at the Download Squad, the latest official beta of Firefox 4 has been released by the Mozilla development team responsible for the web browser. The release is currently in distribution which means it may take a while before it becomes officially available on the homepage. Currently, Firefox 4 Beta 7 is served to downloaders, even on the Beta 8 release notes page which does not feel right to say the least. But that appears to be a temporary problem only, as downloads will be redirected as soon as the new beta of the Internet browser has been spread to all mirror servers. Do not expect lots of new features or changes in this beta or coming betas. The team has already stated that Firefox 4 is feature complete which means there will only be changes to the design, and of course bug fixes, loads of them. Reads the release log. Not a lot to go by to be honest. The interesting part begins below the changes in beta 8, the overall features that have been added to Firefox 4 so far. There are also controversial features like Panorama or the removal of the status bar and the replacement of it with the add-on bar, or the display of link destinations in the address bar and not the new add-on bar. Users who do not want to wait for the download links to be updated on the Mozilla website can use one of the release mirrors to download the new Firefox 4 Beta 8 right away. The Mozilla team seems to be back on track with the release of the seventh beta of the upcoming web browser Firefox 4. The release marks a milestone in the development as this is the first feature complete release of version 4 of the Internet browser. What does it mean? That the developers won't add new features to the browser. All they do from this point in development on is test, test and test to fix bugs and get the browser ready for a prime time release in the beginning of 2011. Several other changes have already been known from previous beta versions, including the removal of the status bar, the addition of the add-on bar in its place and the url bar that now displays link urls when the user hovers the mouse over links on a webpage. Users who have not tested Firefox 4 release so far will have to get used to other changes as well. This includes the one-button menu, the new tab management feature Panorama, the new add-on and plugin manager and other layout and design changes. The official Mozilla website has not been updated yet with the download link of the new version. The new beta release is however already available on the Mozilla ftp server and third party download portals such as Softpedia. Just a week after the release of Firefox 4 Beta 5, the sixth beta of the popular web browser has been released by the Mozilla Firefox development team. The short time between the two releases already indicates that only a few updates and fixes could have made it into the new release. Firefox 4 Beta 6 fixes five bugs, one of which a critical stability bug affecting Windows users, another causing rendering errors with plugins affecting Mac OX X users. Firefox users can take a look at the full bug listing at Bugzilla to read about all fixes in the new beta release of Firefox 4. The latest Firefox 4 Beta 6 is available for download at the official release notes page. Preview releases of the next Firefox 4 beta have already appeared on the Mozilla ftp server, which indicates that there will be at least one additional beta release before the first release candidate sees the light of day. Have you tried a Firefox 4 Beta? Let us know what you liked, and what you did not like in the comments. Today's a big release day over at Mozilla. First it was a new version of the email client Thunderbird that has still not been announced officially. As of this minute, the Mozilla servers are being filled with new Firefox 4.0 Beta 5 releases. The distribution has not been completed yet, and it is likely that it will take at least a few hours before the official announcement is being made over at the Mozilla website. So what's new in the latest Firefox 4 beta? The add-on manager has been redesigned with a new color scheme. The functionality on the other hand seems to have remained the same. Still no option to search for and install add-ons from the manager. Hardware acceleration should be enabled by now by default, at least on Windows. 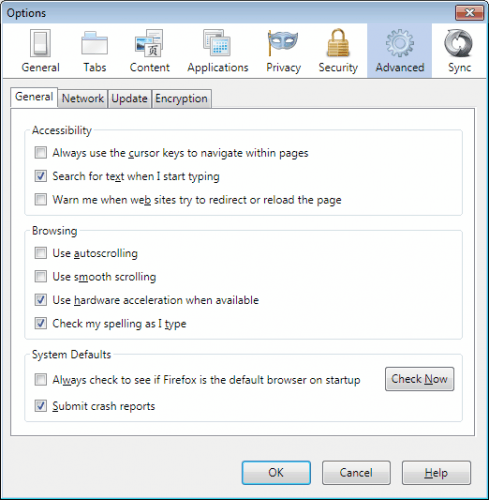 A new setting has been added to the browser's options to disable hardware acceleration. you find it in Tools > Options > Advanced > Use Hardware Acceleration When Available. Finally, the new single menu at the top has been revamped. It opens additional menus when the user hovers with the mouse over an arrow at the end a particular menu item. The menu is actually not as intuitive as it looks like on first glance, as it happens that submenus pop up accidentally whenever the mouse cursor moves over an arrow icon. Keep in mind though that you can return to the old menu structure, or display it temporarily by pressing Alt. Firefox 4 Beta 5 will be available later today. Users who do not want to wait that long can download it from the Mozilla ftp server, or wait until the download portals have uploaded the new version to their servers. Firefox 4 Beta 4 was originally scheduled for a release on August 20, but blocker bugs kept the team from releasing the version on that day. Four days later, and Firefox 4 Beta 4 has finally been released. The next major iteration of Firefox comes closer to the first release candidate which is slated for an October release date. At least three additional beta releases will follow before the appearance of the release candidate. 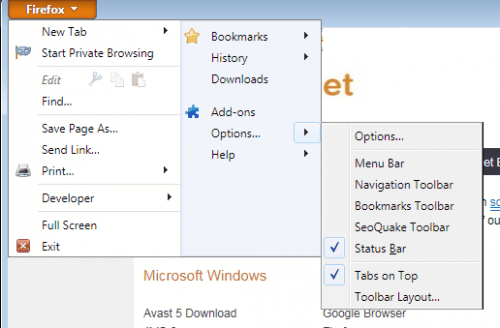 Firefox 4 Beta 4 continues where the last beta left off. 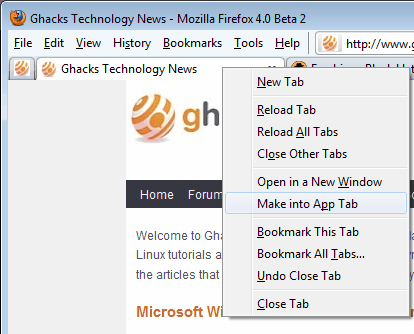 Firefox Sync is enabled by default, and the Tab Candy, Tab Sets, we mean Tab Groups feature has been renamed once more, at least in this beta build. The feature can now be accessed with the keyboard shortcut Ctrl-Space. Direct2D rendering is still not activated by default on Windows. Windows users who want to turn the feature on should take a look at Enable WebGL, Direct2D Rendering In Firefox 4 Beta for instructions on how to turn the feature on. The release notes have not been updated yet, which makes it difficulty to find out if other features have been added or modified in the new release. We will conduct some speed tests right after the publication of this article, and update it accordingly once they are done. The browser overall feels pretty stable after some first testing and shows great progress overall. It won't be as fast as Opera 10.60 when it comes out, but the difference won't be significantly noticeable, and that is all that counts. Firefox 4 Beta 4 has not officially been announced yet. The beta is as usual available on the official Mozilla FTP server. Except an official announcement later today. Firefox 4 Beta 3 is currently in the distribution phase and will be available shortly at the official beta download page for all supported operating systems and languages. Several download portals, including Softpedia, are already offering the English language version of Firefox 4 Beta 3. The release notes have not been updated yet, which means that the official Firefox website does not offer any information at this moment about changes or additions in this beta of Firefox. Mozilla expects to release two additional Firefox 4 beta versions before the release candidates and final versions of the browser. Firefox users should mark the day of the release of the fifth beta of the browser, as it will introduce Mozilla 2, the "most comprehensive iteration (since its creation) of the overall platform on which Firefox and other Mozilla products run". While some changes have been incorporated into Firefox 3 releases, the major changes are slated for a Firefox 4 Beta 5 release. Mozilla designer Brendan Eich mentioned Mozilla 2 in 2006 for the first time, which was originally planned to be released in 2008. Mozilla 2 means among other things a chance to break frozen API compatibility, which removes constraints on the current architecture and allows us to eliminate old APIs and their implementations, renew and improve the APIs and code we want to keep, and realize significant runtime and code size wins. For instance, we can get rid of RDF, which seems to be the main source of "Mozilla ugliness" humorously decried by Steve Yegge. This will kick Ajax performance in Firefox up a notch or three. So Mozilla 2 is not just about simplifying APIs, removing old code and XPCOM overhead, and making the source code more approachable. It's also about material improvements to program security, which is inherently weak in all browsers implemented in languages such as C and C++. Security requires defense at every level of abstraction, from high-level JS that enforces confidentiality properties, down to buffer manipulations that should be provably memory-safe. Firefox users can expect lighter code, and better overall performance of the web browser. The platform goals outline some of the goals the developers have for Firefox 4. 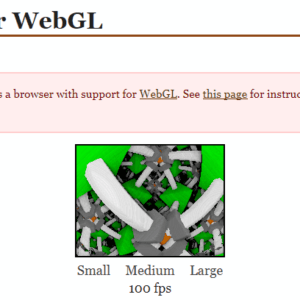 Fully support the WebGL 1.0 spec, with support turned on by default in a Firefox 4 beta on platforms that support OpenGL or OpenGL ES. Accelerate all drawing on Windows Vista and Windows 7, on compatible hardware, by shipping the Direct2D Cairo backend in a Firefox 4 beta. Close the performance gap between Firefox and Chrome on the "Click Preferences *" tests in the Zimbra performance test harness, 30+% speedup from end of Q2. Improve user privacy by reducing the ability of sites to fingerprint individual users, and improve user control and privacy of cookies. Performance goals for reference system: Dell Optiplex 760 (Intel Core2 Duo) Windows Vista. Baseline: Chrome 5.0.375.55. [ON TRACK] V8 Score: 3500-5000. The coming months will be exciting for Firefox users. Mozilla has released Firefox 4 Beta 2 yesterday, a new beta version of the upcoming Firefox 4 web browser. The new version can be downloaded from the release notes or official beta download page. It is as usual available for all supported operating systems (Linux, Mac, Windows) and languages. The "big" new feature in Firefox 4 Beta 2 is App Tabs, which resembles Google Chrome's Pin Tab feature. 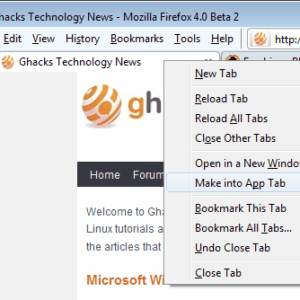 Every tab in Firefox has a new option on right-click to convert it into an App Tab. Those tabs are reduced to their Favicon and placed on the leftmost side of the tabbar. A new page loading animation has been added as well, the favicon of sites in the tabbar is replaced with a loading animation, which switches back to the website's favicon once the page has loaded fully. New HTML5 parser, Support for more HTML5 form controls. Firefox 4 Beta 2 reaches the same score in the HTML5 browser test as the last beta. The browser scores 97 of 100 points in the Acid3 test, but drops 200 points in the Peacekeeper benchmark when compared to the performance of Beta 1. The latest beta of Firefox 4, and actually several previous versions of Firefox as well, have features included that are disabled by default, mostly because they have not been tested enough to enable them for all Internet users by default. Both features can be enabled in the about:config configuration settings of the Firefox browser. What it does: "WebGL enables web content to use an API based on OpenGL ES 2.0 to perform 3D rendering in an HTML canvas in browsers that support it." Type about:config in the Firefox 4 address bar, and enter to load the configuration page. First time users need to accept the warning message before they can continue. Filter for the term webgl which should display four results. Locate webgl.enabled_for_all_sites and double-click the entry to set it from false to true. 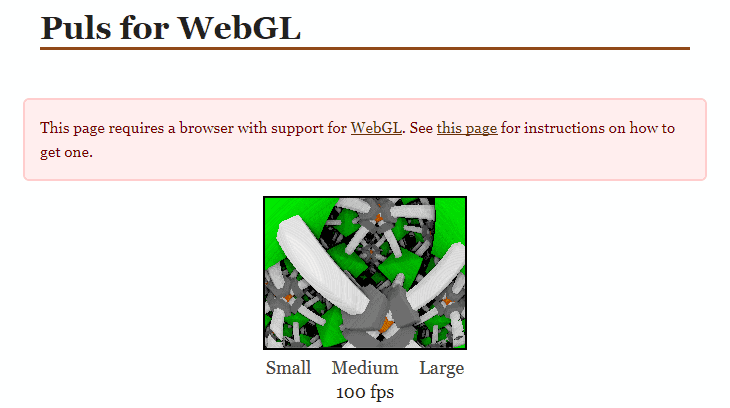 This enables WebGL in Firefox. Restart the browser to apply the changes. It has to be noted that Direct2D is currently only supported by Windows 7 or Windows Vista, with Windows 7 being the recommended operating system. Firefox users should also have a DirectX 10 compatible video card, even though DirectX 9 cards may work but with significantly lower performance gains. And that's how you enable WebGL and Direct2D in the Firefox browser. Have you been experimenting with those parameters? Let us know in the comments. The Mozilla developers have released the first beta of the long awaited Firefox 4.0 web browser. Regular readers might know that this version was offered as Firefox 3.7 previously and has now been renamed to Firefox 4.0, a release of the final version is expected at the end of this year. Firefox 4.0 continues where Firefox 3.7 has left off. It sports a new interface design, something that many veteran Firefox users may have problems adopting with. Browser tabs are now located on top of the address bar by default with the option to revert the changes so that the interface resembles the old Firefox design. A second major change is the addition of the Firefox button, which will be shown if the user decides to hide the menu bar in the browser. This option looks similar to the one-button menu option of the Opera web browser. Firefox 4.0 comes with a new add-ons manager, which is not completely available in the beta release. It is for instance not possible to search for and install add-ons directly from the manager. The HTML5 capabilities have been improved, with support for web standards such as WebM video and other HMTL5 related features. Firefox 4.0 now scores 189 and 9 bonus points out of 300 in the HTMl5 test, an increase of 50 points and 5 bonus points over Firefox 3.6.4. 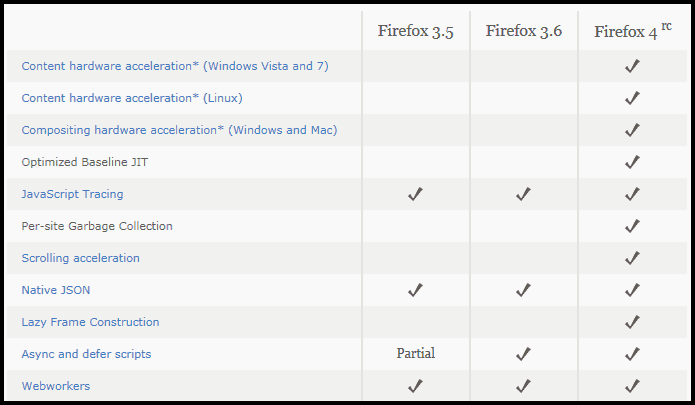 Firefox 4 still lacks behind speed wise in most browser benchmarks but it looks like the developer's have concentrated on interface and feature additions so far. This version features protection against an attack known as CSS fingerprinting which uses lists of popular websites to determine if a user has visited them in the past. Interested users can watch a WebM video about the new release, read the release notes, take a look at the first run page or download versions for Mac, Windows and Linux below. Thanks HDW for the tip. Have you tried the browser already? Let us know what you think about it in the comments. I have followed the development of Firefox 4 from pre-beta to the final release, and have to admit that it was not always a pleasant ride. It looked in the beginning as if the developers planned to make changes for the sake of changes, and not because they made sense or were demanded by the majority of the Firefox community. An awful course of development of both Firefox and Opera, why should they copycat the terrible piece of wood called Chrome? Firefox 4 does not look good. I am not apt to correct its terrible design with the use of themes. The tabs are anti-ergonomic. It seems that Firefox and Opera will force me to make either Safari or K-Meleon my default browser. A great disappointment. 1st. I wish they allowed us to acces bookmarks easily without having to use the menu bar. 2nd. It was amazing , even though slow, and I hope we will see the last RC sooner than October. I love the new design and more than that, I like the render speed. All I need is speed :). it’s an option watch the video. As a Mozilla freak I couldn’t resist to install the beta. Had already the 3.7a installed earlier but went back to 3.6.x cause I had trouble with my ~40 add-ons. The same with 4.0b1. Error messages all over. Installed 3.6.6 over it, and I’m back with 3.6.6. Happy browsing, the time will come. I’m using it at the moment. The layout with the tabs is a lot like chrome which is better. As usual Firefox rocks. But why they are trying to copy the Chrome ? Chrome as people say consumes less memory is absolutely wrong. When I run FF with my 50+ add ons , and tried to do the same with Chrome and it eats more than double the RAM memory . works in Windows XP with minefield 4.0b3pre. Any idea when the most common add-ons (AdBlock, NoScript etc.) will work for FF 4.0? I am waiting for this release mainly to test Tab Groups. still haven’t come out… when!? If you updated from Beta 3, the tab groups button won’t be in the tab strip by default. You have to drag it back in through the customize window. Just loaded it up and it seems a bit better than I remember it being. I started using OPERA as my default awhile back. I still think OPERA is the best for my system but will give FireFox another try for a while. I’ve updated to this version few minutes ago and it’s seems very stable and the new Sync feature is just awesome ! long time lurker but don’t post that often. Noticed something odd for me in FF4 b3 and 4. My hard drive activity immediately after clicking a link is just way too much. This doesn’t happen using FF4 b1 or b2. Used resource monitor and it is indeed coming from my profile folders cache. I created a new, blank profile and started FF with that profile, still the same result. While loading a web page my hard drive is almost off the charts even long after the page is loaded. guichi, can you do me a favor and test the following: open about:config in firefox, filter for browser.safebrowsing.enabled and set the value to false? Then try again and see if the hard disk activity goes away. Thanks martin but it doesn’t help much. Seems to be a longstanding issue since some b3 candidates. Some others on neowin are having the same issue. Where do you get the info for this article? According to what I’ve read, beta 5 will be the last beta before the release candidates start. Re “… was originally scheduled for a release on August 20, but blocker bugs kept the team from releasing the version on that day. Four days later, and Firefox 4 Beta 4 has finally been released”, this seems misleading – the release is time-stamped Aug 18 so they obviously weren’t squashing bugs in the days preceding and following Aug 20 – I suppose a lot depends on what you mean by “originally scheduled”. Look here, http://en.wikipedia.org/wiki/History_of_Mozilla_Firefox. I know it is not official.. Anyone else having this issue? Turning it off brings it back to normal. In the future I will be removing FF from my system. Might be wonderful for technophiles but I wonder what the ‘average user’ is going to make of it. Will it be too gimmicky and too much of a change from what they know? The one thing I think that most people overlook is the fact that Mozilla also gives you an easy way to customize Firefox to make it look just like the old version. If you cared to do any research you would know this. As far as the new menu and tabs on top is concerned get used to it. Chrome has done this for quite some time. This is like when Windows XP first came out, people complained it looked different and stupid, repeated again when Vista came out. We eventually learn to like it or at least get used to it. I feel though that the new Firefox is a welcome change to a great browser that had gotten outdated. Congrats to Mozilla for actually updating it. I’ll still wait for a stable release because of extension compatibility (and a status bar extension. Martin, can you or one of your readers help me? My problem is this: when we hover over a link, this link’s URL also appears in the address bar but with a light gray font. Can I change that to another color? Currently no matter what the color of the present page’s URL is (black in the above example), the color of the link being hovered on remains gray which is a visibility problem for me. Thank You and Season’s Greetings to all at GHacks! Is it not in fact a prerelease of Beta 9 fo Firefox 4 instead ? I don’t think that Firefox 4 will be ready in Febuary. Especially if they are trying to release the 64-bit installer too. I thought they would not? Ha, final release got moved again next month, although Firefox 4 is looking really promising under-the-hood, and I have come to appreciate the subtleties behind its apparent “dumbing down” interface changes as how most people percieved it. I’m still waiting for a good version of Firefox for Android. I need that encrypted password feature (where you choose your encryption key/master password) badly. Right now all the mobile browsers store your site passwords in a generic encryption mode, if any. It’s a hack waiting to happen. No it doesn’t. But how on earth is that relevant here? This is about Firefox. Waiting to get one of the quality product i love using. I don’t care if we get beta 15 as long as the final product is great. I wonder what’s becoming of Firefox 3.5.17 and Firefox 3.6.14, which were announced for today as well. Those with visibility needs who ***like*** the Chrome-type status bubble that posts progress of a click on a link and now appears in the lower left-hand of the browser window, can tweak it a little to make it more visible if needed. This code can be put in userChrome.css and will take effect after a restart. Heavy duty tweakers will prefer the Stylish add-on for seeing the changes immediately. ht tp:/ /for ums.mozill azine.o rg/view topic.ph p?p=10363589&sid=e3ae492d67eea999f6b299522fdb788f#p10363589). Dont think anyone wil use the final as long as it wont play standard windows media player video streams. You are right, corrected and thanks for finding the typo. This is a great bonus to those (like me) who are still using Windows XP and feeling left behind with new browsers implementing web acceleration with Vista and later. Still looking forward to Firefox 4, and keeping a keen eye out on its memory consumption woes. Ummh not to ruin the party here but on Mozilla ftp there are pre-beta 13 available. Anyway I have been using beta 12 for a while and it is fine so I can personally recommend to go ahead and update it. Could be that they have not switched the terminology yet to RC. Why would Asa post that beta 12 is the latest if it is not true? Sure, could be a last minute blocker that forces them to build another beta. Lets wait and see. Martin at this point anything could be but this would add even more confusion to an already pretty messed up story. One thing I have always criticised Mozilla for is its communication: they should learn to shut up and make announcements when they have the “cat in the bag”. How many times we have heard already “it’s the last beta” or “we ship on this date”? They have confirmed that there is no beta 13: “I just wanted to send a quick note clarifying again that Firefox 4 beta 12 is the last planned beta. I don’t find much use in such articles. It would be better to please focus on features and not get caught up in blocker-spotting just because other blogs obsess over these things. It looks like Mozilla chose the lesser of two evils, if you consider taking a good idea from another browser and using it an evil. I’m personally not fussed with either the location bar or bottom corner display solution but no doubt this will make “a lot” of people happy. On the daily build ppa website : https://launchpad.net/~ubuntu-mozilla-daily/+archive/ppa you could find this version firefox-4.0 4.0~b13~hg20110226r63115+nobinonly-0ubuntu1~umd1~maverick. So I can gess there is a build 13. Nikos, that’s a technicality. They will switch that build to RC, there will not be a beta 13. What do you mean by “Technicality” ? Nikos, they just haven not switched the file name to RC, that’s all. Why not make it an option where you can chose where to preview the URLs at either the bottom or in the location bar and make everyone happy, personally i think pages with many links makes displaying the preview URLs invasive and in the way. That’s a build, not a final release. While it may be the same it does not necessarily have to be. How much longer for the final? Next week Monday? I think that what seems to be an general trend to bloat software includes most browsers, except Google Chrome perhaps (which I have not installed for other reasons (lack of options, basic ones!). Indeed, most users what availability of options rather than extended gadgets that most of the time are not even used by them. Software is maybe comparable to fashion, and users are more likely to wear “prêt-à-porter” than “haute couture” … I mean, even Opera is its new 11.10 beta is proposing a new layout of its SpeedDial which seems to bother most users who’ve tested it, once again as Martin stated, “as if the developers planned to make changes for the sake of changes”, applicable elsewhere than Fiirefox as well. Good article with helpful links. Thanks for the Download links as I could install Firefox 4 before the official release. I just update version 4 over version 3.6.15. Got the old menu bar automatically. Some of the add-ons are not compatible yet : FEBE, Firedownload, Kaspersky url advisor, BetterSearch, Perspectives. Another problem, some of the add-ons icons like NoScript, WOT.. appear to the left of the url bar, and some like Adblock Plus, Home.. appear to the right of the url bar. I just randomly was googling for the mozilla 4.0 planned release date to magically discover it was coming tomorrow. THen found out it was FTP available now. But then I checked my version to ensure I was still running 4.0b12 and . . . surprisingly, it has already automatically self-updated to 4.0 while I was a sleep. Awesome. But the devs do not like direct links to the ftp. My laptop or computer can’t take care of a software firewall software so I are hoping the actual built-in firewall involving my Linksys Wireless-G Switch will be good enough.